The Gospel of Thomas is an important but long lost work of the New Testament Apocrypha, completely preserved in a Coptic manuscript discovered in 1945 at Nag Hammadi, Egypt. Unlike the four canonical gospels, which combine substantial narrative accounts of the life of Jesus with his sayings, Thomas is a "sayings gospel" with little narrative text. It is attributed to the apostle Didymus Judas Thomas. While believed by many scholars to have been written quite early, its theological perspective is markedly different from the biblical gospels in that the resurrection of Jesus plays no part in it, and it emphasizes a mystical understanding of Jesus' teachings, rather than the sacraments of baptism and the Eucharist. The Gospel of Thomas comprises 114 sayings of Jesus. Some of these sayings resemble or are identical to those found in the four canonical Gospels (Matthew, Mark, Luke, and John). Many, however, were unknown until the gospel's discovery. The work begins with the words, "These are the secret sayings which the living Jesus spoke and which Didymus Judas Thomas wrote down. And he said, 'Whoever finds the interpretation of these sayings will not experience death.'" Since its discovery, the Gospel of Thomas has been a major source of discussion and controversy among biblical scholars. Some believe it to have inspired a major group of first century Christians and that the gospels of Luke and John were written in part to refute its teachings. Others consider it to have been written in the mid to late second century as part of the heretical movement of Gnosticism. A good deal of discussion has also been devoted to the relationship between the Gospel of Thomas and the hypothetical Q document, a collection of Jesus' sayings which many scholars believe was used in both Matthew and Luke. The Gospel of Thomas is regarded by some as the single most important find in understanding early Christianity outside the New Testament. It offers a window into the world view of ancient culture, as well as the debates and struggles within the early Christian community. The Gospel of Thomas is certainly one of the earliest accounts of the teaching of Jesus outside of the canonical gospels, and so is considered a valuable text by biblical scholars of all persuasions. It claims to contain special revelations and parables made known only to the apostle Thomas. Jesus teaches the disciples. A central theme of the Gospel of Thomas is that salvation comes through true understanding of Jesus' teaching rather than by faith in the his bodily resurrection. Furthermore, most readers are struck by the fact that this gospel makes no mention of Jesus' resurrection, a crucial point of faith among Christians. Nor does it emphasize the salvific value of Jesus' death on the cross or the sacraments of baptism and communion. Instead, it portrays Jesus' role as primarily that of guide and teacher, providing the special knowledge needed for each person to attain the Christhood that he himself manifested. Some scholars consider the Gospel of Thomas to be a Gnostic text, since it emphasizes the importance of spiritual knowledge (Greek: gnosis) and was found among a collection of other, more clearly gnostic texts. Others reject this interpretation, however, because Thomas lacks the full-blown mythology of Gnosticism as described by such Church Fathers as Irenaeus of Lyons (ca. 185). Many consider it a "proto-gnostic" work, affirming the basic Gnostic belief that only the true knowledge of Jesus' teaching enables one to realize his or her own inner Christhood, but not promoting a formal Gnostic cosmology found in later gnostic texts. In this view, later Gnostic Christianity may have had its roots in the "Thomas community." The Gospel of Thomas also differs from the synoptic gospel and the Gospel of John in terms of whom it looks to for leadership. The synoptics make it clear that Saint Peter is to be the central figure of the church after Jesus' death. Thus Jesus gives the keys to the Kingdom of God to Peter and announces "on this rock I will build my church." In John, Peter and John are the two chief disciples. In Thomas' gospel, the figure of Thomas conveys Jesus' teachings to the reader, but, surprisingly, none of Jesus' 12 original followers is to be the leader of the church after his death. Rather it is "James the Just," the leader of the Jerusalem church in the Book of Acts, referred to as "the Lord's brother." James also seems to have a significance beyond mere leadership. As verse 12 puts it: "The disciples said to Jesus, "We know that you will leave us. Who will be our leader?" Jesus said to them, "Wherever you are, you are to go to James the Just. For his sake heaven and earth came into being." No major Christian church accepts this gospel as canonical or authoritative. However, the Jesus Seminar, an association of noted biblical scholars, includes it as the "Fifth Gospel" in its deliberation on the historical Jesus. Virtually all biblical scholars recognize it as an important work for understanding the theoretical ''Q'' document, a collection of sayings and teachings used by Matthew and Luke but absent from Mark and John. The fact that Thomas is a "sayings gospel" tends to confirm the theory of Q's existence and has stimulated much discussion on the relationship between Thomas and Q. The gospel of Thomas begins, "These are the sayings that the living Jesus spoke and Didymos Judas Thomas recorded." The words "Didymos" (Greek) and "Thomas" (The Aramaic: Tau'ma) both mean "Twin" and may be titles rather than names. Some scholars speculate that he is called the "twin" of Jesus to denote a spiritual unity between the disciple and his master, as referenced in Thomas v. 13, where Jesus says, "I am not your teacher. Because you have drank and become drunk from the very same spring from which I draw." Some scholars hold that the Gospel of John tells the story of "Doubting Thomas" both to dramatize the physical nature of Jesus' resurrection and to denigrate those who adhered to the attitude presented in the Gospel of Thomas. A central theme of the Gospel of Thomas is that salvation comes through true understanding of the words of Jesus, rather than through faith in his resurrection or partaking in the sacraments of the church. This, and the fact that it is a "sayings" gospel with very little description of the activities of Jesus and no reference to his crucifixion and resurrection, is what distinguishes this gospel from the four canonical gospels. In the synoptic gospels (Matthew, Mark, and Luke), Jesus is the Messiah who has come to earth to die for our sins that we might be saved through by faith in his resurrection. The Gospel of John adds that Jesus is a divine heir of the godhead and places particular emphasis on the sacrament of holy communion. In Thomas' gospel, on the other hand, Jesus is primarily a teacher and a spiritual role model. One is not saved by faith in him, but by understanding his teachings and realizing the potential to attain Christhood, just as Jesus did. The Gospel of Thomas is thus more mystical than the canonical gospels and emphasizes a direct and unmediated experience of the Divine. While in John Jesus stresses the sacraments and says "Whoever eats my flesh and drinks my blood has eternal life, and I will raise him up at the last day," in Thomas, Jesus emphasizes his teaching of spiritual truth and says, "Whoever drinks from my mouth will become as I am; I myself shall become that person, and the hidden things will be revealed to him." (Thomas 108) In Thomas v.3, Jesus says, "… the Kingdom of God is within you." This saying also found in Luke 17:21, but in Thomas' gospel it is a consistent and central theme. Elaine Pagels, one of the pre-eminent scholars of the Gospel of Thomas, argued in her book Beyond Belief that Thomas was widely read in the early church and that portions of both Luke's and John's gospels were designed specifically to refute its viewpoint. John in particular goes out of the way to prove that Jesus' resurrection was physical. 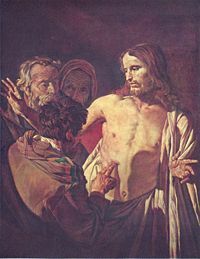 It has long been thought by biblical scholars that the story of Doubting Thomas served to refute those Christians who believed the resurrection was spiritual and not physical, but in Pagels' view it is no coincidence that Thomas happens to be the one disciple who adamantly doubts the resurrection and must have it demonstrated to him in graphic, indeed gruesome, detail (John 20:24-30). She concludes that Thomas gives us a rare glimpse into the diversity of beliefs in the early Christian community, and a check on what many modern Christians take for granted as being "heretical." 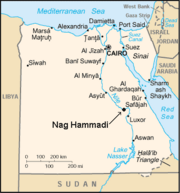 Map shows the location of Nag Hammadi, where the complete text of the Gospel of Thomas was discovered in 1945. When the Coptic version of the complete text of Thomas was found at Nag Hammadi, scholars realized for the first time that three separate Greek portions of this gospel had already been discovered in Oxyrhynchus, Egypt, in 1898. The manuscripts bearing the Greek fragments of the Gospel of Thomas have been dated to about 200 C.E., and a manuscript of the Coptic version to about 340 C.E. 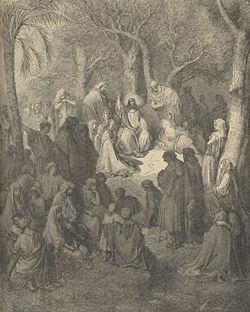 The Gospel of Thomas is distinct and not directly related to other apocryphal or pseudepigraphal works that bear Thomas' name, such as the Acts of Thomas or the work called the Infancy Gospel of Thomas, which expands on the canonical texts to describe the miraculous childhood of Jesus. The Gospel of Thomas is also distinct from the Book of Thomas the Contender, a more clearly Gnostic text. In the fourth century, Church Father Cyril of Jerusalem mentioned a "Gospel of Thomas" in his Cathechesis V, saying: "Let none read the gospel according to Thomas, for it is the work, not of one of the twelve apostles, but of one of Mani's three wicked disciples." It is possible that he refers to the Gospel of Thomas discussed in this article, although Manichaean dualism is hard to detect in it. The text of the Gospel of Thomas has been available to the general public since 1975. It has been translated, published and annotated in several languages. The original version is the property of Egypt's Department of Antiquities. The first photographic edition was published in 1956, and its first critical analysis appeared in 1959. There is much debate about when the text was composed, with scholars generally falling into two main camps: an early camp favoring a date prior to the gospels of Luke and John, possibly as early as the mid-50s C.E, and a late camp favoring a time well after the last of the canonical gospels, probably in the mid-100s C.E. The resurrected Jesus appears to the disciples and later eats a meal with them. Pagels (2003) argues that both John's and Luke's gospels contain passages designed to refute the "Thomas Christians" who believed that true followers of Jesus could attain Christhood equal to that of Jesus himself. Thomas does not mention the physical resurrection and Jesus acknowledges that Thomas, the ideal disciple, no longer needs his teaching. However, in John's gospel, Thomas physically touches the resurrected Jesus and them humbly acknowledges Jesus as "my Lord and my God." (John 20:28) Likewise, in the Gospel of Luke, the resurrected Jesus goes out of his way to prove that he is not a mere spirit, saying "Look at my hands and my feet. It is I myself! Touch me and see; a ghost does not have flesh and bones, as you see I have." 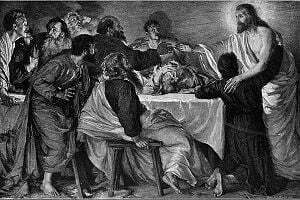 (Luke 24:38) To further prove the physical nature of the resurrection, Luke portrays Jesus as eating a meal with the disciples, specifying that he ate a broiled fish in their presence. Some in the "early camp" claim that the Gospel of Thomas is closely related to the hypothetical Q document, a collection of sayings found in Matthew and Luke, but absent from the Gospel of Mark. 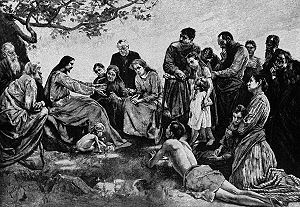 Others in the early camp—those who argue for a date sometime in the 50s—see common themes in Paul's epistles and Thomas which are absent from the canonical gospels. According to this theory, Paul drew on sayings widely recognized to have come from Jesus, some which are uniquely preserved in the Gospel of Thomas. The early camp also notes that Thomas reflects very little of the full-blown Valentinian Gnosticism seen in many of the other texts in the cache of manuscripts found at Nag Hammadi. It thus represents a kind of proto-gnosticism, reflecting a time when the Christian community had not yet divided between the groups who later became known as gnostic and orthodox Christians. The late camp, on the other hand, dates Thomas sometime after 100 C.E., generally in the mid-second century. Some argue that Thomas is dependent on the Diatessaron, which was composed shortly after 172 C.E.. Moreover, the Greek fragments of Thomas found in Egypt are typically dated between 140 and 200 C.E.. Noted biblical scholar Bart D. Ehrman, in Jesus: Apocalyptic Prophet of the Millennium, argued that the historical Jesus was a failed apocalyptic preacher, and that his fervent apocalyptic beliefs are recorded in the earliest Christian documents, namely Mark and the authentic Pauline epistles. The earliest Christians, still clinging to Jesus' apocalyptic teaching, believed Jesus would soon return, and their beliefs are echoed in the earliest Christian writings. As the Second Coming did not materialize, later gospels, such as Luke and John, deemphasized an imminent end of the world. Likewise, many sayings in the Gospel of Thomas treat the idea of the imminent end of the world as a profoundly mistaken view, emphasizing that the real Kingdom of God is within the human heart. Such a viewpoint implies a late date. Another argument put forth by the late camp is an argument from redaction. Under the most commonly accepted solution to the Synoptic problem, Matthew and Luke both used Mark as well as a lost sayings collection called Q to compose their gospels. Sometimes Matthew and Luke modified the wording of their source, Mark (or Q), and the modified text is known as redaction. Proponents of the late camp argue that some of this secondary redaction created by Matthew and Luke shows up in Thomas, which means that Thomas was written after Matthew and Luke were composed. Since Matthew and Luke are generally thought to have been composed in the 80s and 90s, Thomas would have to be composed later than that. Various other arguments are presented countered by both camps. 1. "Whoever discovers the interpretation of these sayings will not taste death." The Sermon on the Mount: The entire Gospel of Thomas is composed of sayings of Jesus, with very little narration. 13. … And he took him, and withdrew, and spoke three sayings to him. When Thomas came back to his friends they asked him, "What did Jesus say to you?" Thomas said to them, "If I tell you one of the sayings he spoke to me, you will pick up rocks and stone me, and fire will come from the rocks and devour you." 22. Jesus said to them, "When you make the two into one, and when you make the inner like the outer and the outer like the inner, and the upper like the lower, and when you make male and female into a single one… then you will enter [the kingdom]." 37. His disciples said, "When will you appear to us, and when will we see you?" Jesus said, "When you strip without being ashamed, and you take your clothes…, then [you] will see the son of the living one and you will not be afraid." 92. Jesus said, "Seek and you will find. In the past, however, I did not tell you the things about which you asked me then. Now I am willing to tell them, but you are not seeking them." 101. "Whoever does not hate [father] and mother as I do cannot be my [disciple], and whoever does [not] love [father and] mother as I do cannot be my [disciple]. For my mother […], but my true [mother] gave me life." Thomas Collection at The Gnosis Archive. www.gnosis.org. Hugh McGregor Ross' translation and commentary. www.gospelofthomas.info. Various Translations and Resources. www.earlychristianwritings.com. History of "Gospel of Thomas"
This page was last modified on 27 June 2017, at 16:14.